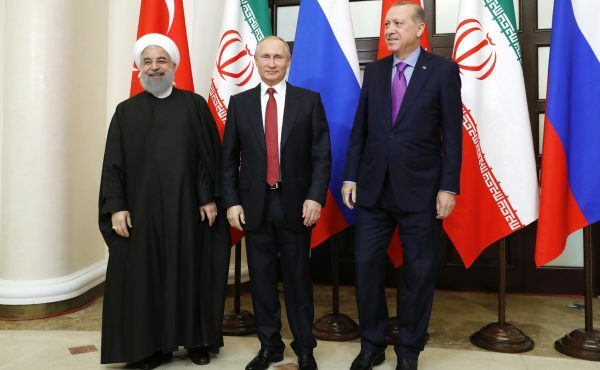 The Presidents of Iran, Russia and Turkey have concluded a tripartite summit on Syria in Sochi and say there is a real chance for peace now that the Islamic State has been largely defeated. With IS forces routed in Syria (and Iraq), a cessation of hostilities in full effect, and hundreds of thousands of Syrian refugees returning home, Russian President Vladimir Putin said that there is a real chance a political settlement will end the seven-year civil war. The three leaders meeting in Sochi said the momentum was now such that they would sponsor an international conference involving all conflict parties to bring the war to an end. assist the Syrians in restoring unity of the country, and achieving political solution of the crisis through an inclusive, free, fair and transparent Syrian-led and Syrian-owned process leading to constitution enjoying the support of the Syrian people and free and fair elections with the participation of all eligible Syrians under appropriate United Nations supervision. Syrian President Bashar Al Assad was in Sochi earlier this week and agreed to the political reforms that Russia has proposed to move the peace settlement ahead. But Putin warned that the reforms would not be easy and would require “compromise and concessions” from all parties to the conflict. In previous years, Saudi Arabia – which has backed the mostly Islamist rebel factions against Assad – had ruled out a future role for the Syrian president. But after a number of meetings between Putin and Saudi leaders, they appear to have backed away from that demand. The US also appears to have softened its anti-Assad position in the post-conflict period. Meanwhile, Syrian opposition groups – which have been involved in previous UN-sponsored negotiations, but are deeply fragmented – met in Saudi Arabia yesterday to unify their position ahead another round of talks in Geneva. Iran, Russia and Turkey have said that no members of the Al Nusra, Al Qaeda or Islamic State terrorist groups will be part of the talks. “The exclusion of terrorist aspects from the process is still among Turkey’s priorities,” Turkish President Recep Tayyip Erdogan said in Sochi. “It is critical for all parties to contribute to a permanent and acceptable political solution for the people of Syria,” Erdogan said, adding that he believed a conference on Syria would produce tangible results toward peace. As it did with the talks in Astana, the United Nations has thrown its support behind the Iran-Russia-Turkey peace initiative.